Below are common attributes associated to Black Knight Butterfly Bush. Become a care taker for Black Knight Butterfly Bush! Below are member comments regarding how to plant Black Knight Butterfly Bush. No comments have been posted regarding how to plant Black Knight Butterfly Bush. Be the first! Do you know how to plant Black Knight Butterfly Bush? Below are member comments regarding how to prune Black Knight Butterfly Bush. No comments have been posted regarding how to prune Black Knight Butterfly Bush. Be the first! Do you know how to prune Black Knight Butterfly Bush? Below are member comments regarding how to fertilize Black Knight Butterfly Bush. No comments have been posted regarding how to fertilize Black Knight Butterfly Bush. Be the first! 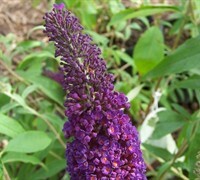 Do you know how to fertlize and water Black Knight Butterfly Bush? Below are member comments regarding how to deal with Black Knight Butterfly Bush's pests and problems. No comments have been posted regarding how to deal with Black Knight Butterfly Bush's pests and problems. Be the first! Do you know how to deal with pests and problems with Black Knight Butterfly Bush? Looking for Black Knight Butterfly Bush? Get Black Knight Butterfly Bush fresh and large directly from the grower to your garden! Buy Black Knight Butterfly Bush online from the nursery wholesalers and save BIG! During the the warm season, when butterfly bush are blooming, you can deadhead to remove faded blooms anytime during the season. Just snip the bloom itself off as two new flowers will most likely already be emerging just beneath the faded bloom. In warmer regions, during late winter you can hard prune your butterfly bush removing 50% or more of the top of your plant. If you want, you can actually prune butterfly bush back to 6 to 8 inch stumps. In colder regions, it is best to wait until spring has arrived to prune butterfly bush. You want to leave the canes to trap and hold a layer of insulating snow at the base of the plant during the coldest parts of winter. Prune after snow has left for the season. Butterfly bush are very drought tolerant plants that prefer growing in a location that provides well-drained soil and plenty of sunshine. A little afternoon shade won't hurt. Black Knight grows quite tall, up to 10 feet or so with a 5-6 foot spread, so give it plenty of room to grow. They make a great background in the butterfly garden. There are no serious problems with pest or disease. Consistently moist or wet soils can cause problems with the roots. Plant in well-drained soil. Deer don't bother buddleia.